ROME (CNS) — While the process of healing and reconciliation continues in Colombia after 52 years of war, Salesians in the country are helping some of the most vulnerable victims of the conflict: former child-soldiers. On the lush green hillsides of Colombia’s second-largest city, Medellin, sits “Ciudad Don Bosco” (“Don Bosco City”), an oasis of peace for young men and women who continue to bear — both physically and mentally — the scars of war and violence. Two former child-soldiers along with Salesian Father Rafael Bejarano, director of “Ciudad Don Bosco,” and James Areiza, the home’s program director for child protection, were in Rome Feb. 2 to present a documentary on some of the children’s journey toward recovery and reintegration. The Salesian-produced short film, “Alto de Fuego” (“Cease-fire”), follows the stories of Catalina and Manuel, two former child-soldiers who are slowly rebuilding their lives at the Salesian house after enduring the carnage of guerilla warfare at a young age. Nineteen-year old Catalina — her real name kept hidden — joined the guerrilla group FARC, the Spanish acronym for the Revolutionary Armed Forces of Colombia, at the age of 13 after enduring physical abuse by her stepfather and an attempted suicide, she told reporters in Rome. Children such as Catalina, fleeing from poverty and abuse, are the primary target of guerrilla groups as they can be easily manipulated by fear, often enduring physical, sexual and psychological abuse at the hands of their commanders, according to the documentary. “In the beginning, everything was fine. Eight days later, they gave me a gun that was bigger than me,” Catalina told journalists. After just a few days, Catalina took part in her first battle against government forces. She vividly recalled the arrival of eight helicopters that proceeded to attack her battalion. “We were 44 young people and adults and by the end of the attack, we were 22. It’s a deep pain I carry with me,” she said. In the documentary, she recalled her final moments with her first love, a boy she knew since she was 13. A helicopter bombed the area where the two were camped out and they realized government forces were advancing. Her boyfriend told her to run as he provided cover fire. “He was covering me and I told him, ‘Come on, don’t leave me alone.’ And he said, ‘Yes, wait, wait, wait.’ And I heard (machine gun fire). When I said, ‘Baby, now!’ he didn’t answer me. They killed him for covering me,” she said. After several years, Catalina escaped and found her way to “Ciudad Don Bosco,” which provides shelter, education and most importantly, a sense of normalcy after a life of violence. Areiza, who is also a teacher, told journalists that “Ciudad Don Bosco” follows a Salesian pastoral model to help former child-soldiers regain the first fundamental element in their recovery: trust. “It means (providing) empathy, closeness and trust when they arrive so they can feel like they are part of a family,” he said. Therapy and group work also are important for instilling in the young people a sense of hope for the future and convincing them that they can achieve their goals and successfully reintegrate into society. 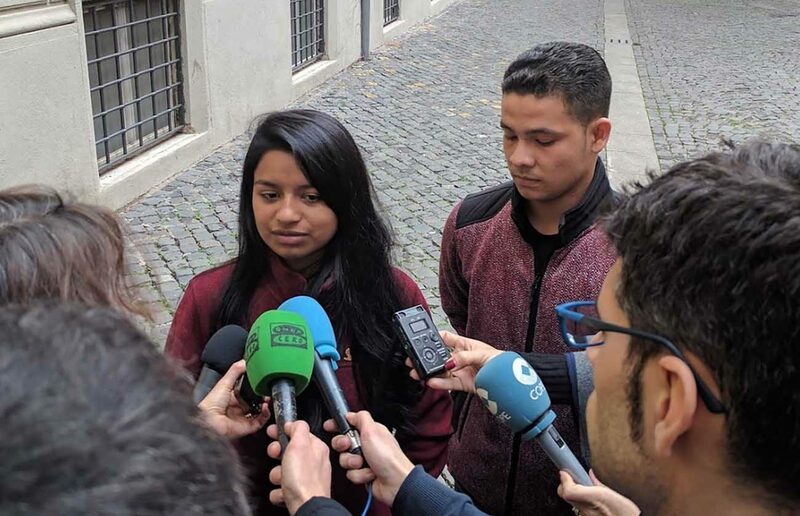 Father Bejarano said that the Salesians and the Catholic Church in Colombia “believe in young people’s dreams” and that Catalina and Manuel are just two of the many young people who have regained their hope, joy and dignity. “We always believed that through our work — the Salesian youth pastoral ministry — we are walking with young people and help strengthen their personality so that they can turn their dreams into reality,” he said.